U.S. Vice President Mike Pence has reassured South Korea that America has its back on security issues. But he has a much tougher message on trade. "We have to be honest where our trade relationship is falling short," he said at a meeting with business leaders in Seoul on Tuesday. "Our businesses continue to face too many barriers to entry, which tilts the playing field against American workers and American growth." 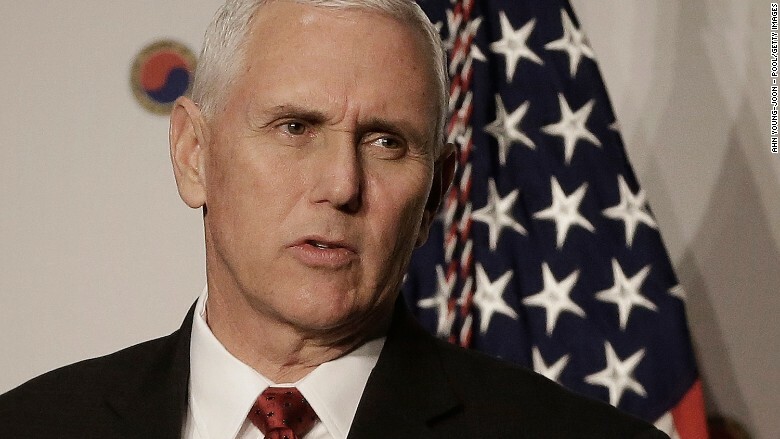 Pence pointed out that the U.S. trade deficit with South Korea has more than doubled since the current free trade agreement between the two countries came into effect in 2012. The Trump administration plans to "reform" the existing deal to level the playing field, he told the room of executives, most of whom represented U.S. companies doing business in South Korea. The U.S. trade deficit in goods with South Korea increased from $13.2 billion in 2011 to $27.7 billion last year, according to U.S. government figures. The trade deficit for goods and services is smaller, at $17.5 billion. But it's grown faster, more than tripling from $5.4 billion in 2011. Trump has ordered a wide-ranging review of America's deficits with top trading partners aimed at determining how much is the result of cheating, unfair practices and currency manipulation. South Korea is the U.S.'s sixth largest trading partner in goods. Mike Pence said U.S. businesses "continue to face too many barriers to entry" in South Korea. Some economists have criticized the Trump administration's focus on trade deficits as a way of viewing U.S. economic ties with the rest of the world. They say it fails to take into account the complex patterns of global trade, pointing out that the U.S. has run big deficits during periods of strong economic growth. South Korean government officials sought to play down Pence's comments about overhauling the existing trade agreement between the two countries. Park Chan-ki, an official at the Trade Ministry, said the U.S. hasn't made any official request to start talks about reforming the U.S.-Korea trade agreement. Growth is slowing in South Korea's economy, which is already facing a number of headwinds, including unofficial sanctions from China, political turmoil and a crisis in its shipping and shipbuilding industries.